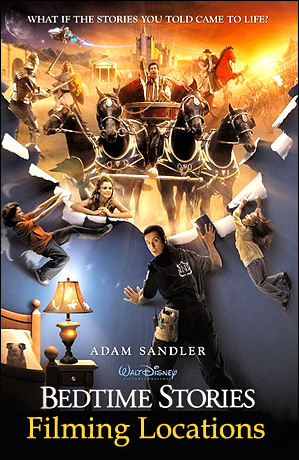 the 2008 Adam Sandler comedy, "Bedtime Stories", was filmed. In the movie, 'Skeeter' (Adam Sandler) is the son of the owner of a small motel called The Sunny Vista. Skeeter is reduced (Cinderella-style) to working as the hotel handyman. which you can find at 11117 Ventura Blvd, in Studio City, CA. of Vineland Ave, and about a mile northwest of Universal Studios Hollywood. stories seem to be coming true in the real world. His sister's house can be found at 800 Adelaine Ave, in South Pasadena, CA. two blocks south of the Pasadena (110) Freeway. of gumballs overturns on an overpass above Skeeter, sending down a shower of gumballs. This Gumball Scene was shot on Seaside Way, in Long Beach, CA. which is the south end of Magnolia Avenue (where it becomes the Queensway Bridge). The camera is looking east, and the garage you see behind him is for One Oceangate Plaza. is the same plaza where Agent Lundy bumps into the Trinity Killer. In one of his original bedtime stories, we see Skeeter as a medieval squire at a castle. is a long way from Los Angeles, at 4045 N. Saint Helena Highway, Calistoga, CA. Sacramento, about a quarter mile south of the Highway (at the end of the winery's road). about him getting a free Ferrari (horse), he has high hopes of getting a free Ferrari (car) in real life. In the screenshot above, we see him looking into the window of a Ferrari dealership. you can find it at 9372 Wilshire Blvd, Beverly Hills, CA. That's on the west side of Wilshire, between Canon & Crescent. aggressive paparazzi outside of a restaurant - and he rescues her. 1099 Westwood Blvd, in Westwood Village, just south of the UCLA campus. The scene plays out along the west side of that restaurant, on the 1700 block of Broxton Ave.
the beach (near a red Hot Dog on a Stick stand) with 'Jill' (Keri Russell), the kids' babysitter. in an area known as Muscle Beach, at 1633 Ocean Front Walk, in Santa Monica, CA. Muscle Beach (and the hot dog stand) is just south of the Santa Monica Pier. Not surprisingly, the "cave" turns out to be under that very pier. at the west end of Colorado Ave. The camera is looking northwest. & fire eaters, gets stung by a bee, and winds up being fired by his boss instead. in Thousand Oaks, CA - a few miles west of the Los Angeles/Ventura County line. is going to be demolished to make way for the new hotel, she stages a protest at the school. It's a few blocks south of Hancock Park, about two miles southeast of Farmers Market & The Grove. his new hotel somewhere else, so they can save the school. at the east end of Holly Street, where Holly ends at Garfield Ave. The photos on this page are stills from the DVD of "Bedtime Stories"
(which you can buy by clicking here) and are copyright Walt Disney Studio.